From left to right: Wolak Group Event Coordinator Sid Haight; Dunkin’ Brands Operations Manager Tim Bricault; Dunkin’ Donuts Integrated Marketing Manager Eric Stensland; Dunkin’ Donuts Franchisee Tom Santurri, Wolak Group Chief of Staff Bob Alberti; Food Bank of Central New York Chief Operating Officer Karen Belcher; and Dunkin’ Donuts mascot Cuppie. 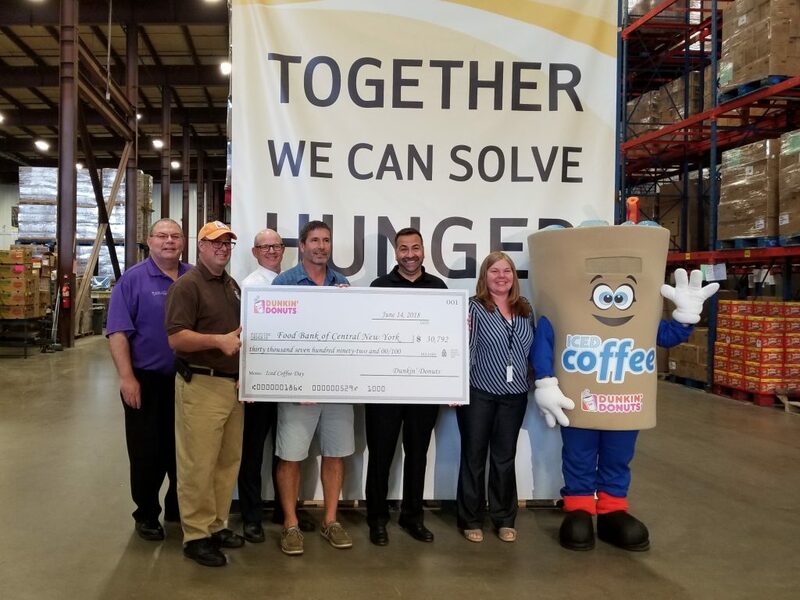 SYRACUSE, NY; – Dunkin’ Donuts today celebrated the results of its recent Iced Coffee Day campaign with a donation of approximately $30,000 to Food Bank of Central New York. During the one-day event on May 23, Dunkin’ Donuts franchisees donated $1 from every cup of Iced Coffee sold at participating Dunkin’ Donuts restaurants in Central New York to the Food Bank. Iced Coffee Day has generated more than $150,000 for Central New York charities since 2012. Food Bank of Central New York serves as the primary food supplier to the emergency food network, comprised of 364 partner agencies, within an eleven county service area across central and northern New York. The Food Bank will provide more than 15 million pounds of nutritious food this year – the equivalent of 12.5 million meals – to hungry families, children, and seniors. Dunkin’ Donuts keeps families running all day long with Iced Coffee, both at home and on the go. Guests can customize their Iced Coffee in Dunkin’ Donuts restaurants to be just the way they like it, with many different dairy, sweetener and flavor options. Dunkin’ Donuts is the market leader in the Iced Coffee category, delivering refreshing Iced Coffee to guests every day, with a consistently smooth, delicious taste. To learn more about Dunkin’ Donuts, visit www.DunkinDonuts.com or follow us on Facebook (www.facebook.com/DunkinDonuts) and Twitter (www.twitter.com/dunkincny).